I have alot to do this upcoming week and I thought a list would kind of keep things in order. 1. Make some real progress on the Jean Quilt - I have 2 more rows cut out and sitting in a pile ready to sew together. I would like to do those 2 rows and possibly add another 3 rows or so. I also need to pull out the old graph paper and figure out a new layout for the quilt as I don't have enough of the pink to do the whole quilt and I need to up the quilt from Baby Quilt size to Picnic Blanket size. 2. 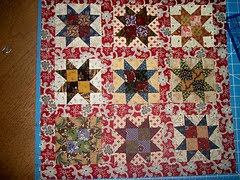 I need to put together blocks 2 and 3 of the Henrietta Whisker's quilt so I can some what get caught up with the BOM. I would like to get current with the quilt by the first week of August. 3. I would like to cut the pieces for the Birdie Stitches BOM. In the quilt layout it gives the directions for the whole quilt top so I want to get all of the pieces ready to sew together. I would like to squish more into the upcoming week but I don't want to get to much on my plate and overwhelm myself as this is quite a bit already. There are a couple of doll quilts that I have the peices all cut for and if I finish everything else that I would like to put together .